Homemade taco seasoning is so easy and inexpensive to make at home. There is no need to rush off to the store and purchases the envelopes (unless you can score them for free with coupons). 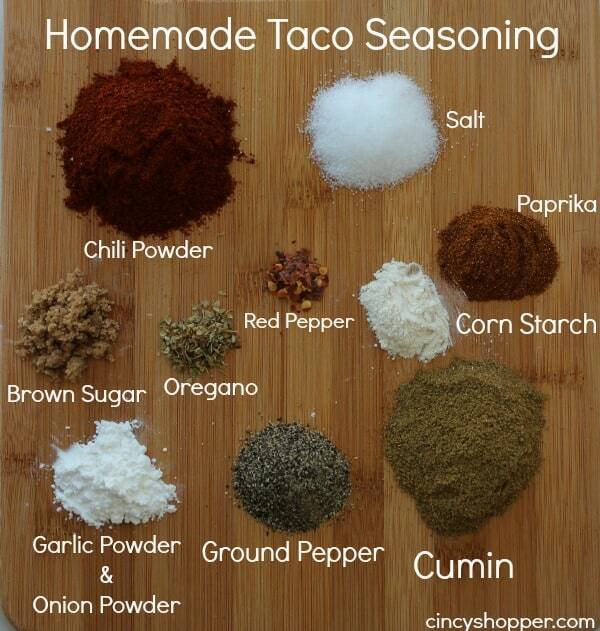 Most likely you have all of the spices right in your spice cabinet to make your own homemade taco seasoning. I will admit in the past we have picked up the taco seasoning envelopes when they are free or cheap. Or, the hubby use to pick up taco seasoning in bulk. Lately he has been making this awesome Taco Seasoning recipe he put together. The whole family thought it tasted great and seasoned up our meat with some great flavors. Next time you run out of envelopes reach for your spices in your spice cabinet when you are making your next Mexican dish. Have you been able to upscale this and make it in bulk ? Didnt have paprika, corn starch, brown sugar or cayenne but still tasted GREAT!